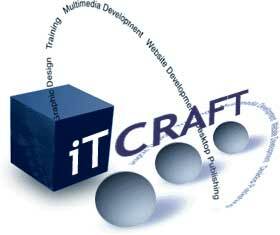 At iTCRAFT we take great pleasure in creating commercially effective and well crafted Web sites for any organisation that wishes to take advantage of the many opportunities that are emerging on the new digital frontier - the Internet. We can offer you a wide choice of websites. These range from an entry level site to more complex dynamic sites that are fully integrated with your databases. As an Internet Presence Provider, our task does not end with creating your site but carries on to make sure you receive all the know-how about marketing, advertising and selling on the net. We are committed to offering an affordable yet high quality web design service, tailored to your needs and budget. We can design and implement web sites, arrange hosting and domain name registration and offer continuing maintenance.